In 2009 my parents gave me their travel wish-list and my darling Mother, petrified of flying who only a few years prior obtained her passport, announced her desire to jet-off to India and see the Taj Mahal. Here’s how we toured India’s iconic golden triangle (Delhi, Agra and Jaipur) in luxurious style. Notice the absence of pictures from the sound and light show at the Red Fort, the majestic Tomb of Humayun, my mom in her giant blue-flowered robe at Jama Masjid, the largest mosque in India (we were fully covered, yet the provided adornment helps locals quickly identify tourists in the courtyard which has capacity for 25,000 people), and from Gandhi’s house (Gandhi Smriti) where we walked in the garden and followed the Mahatma’s final footsteps prior to his assassination on 30th January 1948 — I deleted those photos in an stone-cold-panic as I hastily cleared a memory card at the Taj, smooth move. Leaving Delhi, just 40km outside Agra stands the UNESCO World Heritage Site, Fatehpur Sikri (City of Victory), the short-lived capital of the Mughal empire during the reign of Emperor Akbar. Worth the drive to wonder through the immaculately preserved monuments and architectural wonders of the abandoned citadel city. Onwards to the town of Agra with hectic festival-like chaos, streets teeming with people, motorbikes, tuk-tuks, cows, and one lost monkey. The opulent Oberoi Amarvilas boasts each room views the Taj plus the hotel offers private golf cart transport to the Taj gate. Pictures of the Taj Mahal (no these don’t do it justice; yes we have ten thousand more). In the Pink City Jaipur, we entered the regal world of the Rambagh Palace Hotel. Welcomed like a Maharani, hotel guests are driven from the front gates in a vintage 1937 sedan, led by royal guard on horseback in procession with umbrella canopies; upon arrival walk atop strewn rose petals to the lobby where ointments and a tropical drink await. 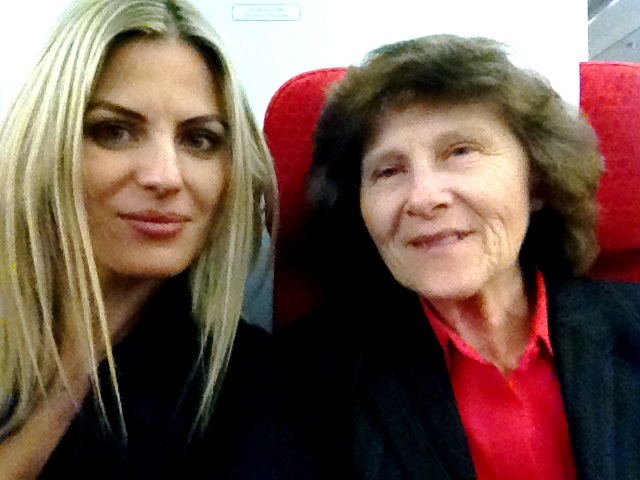 Post-holiday I reflected on this new phase of life, a grown woman traveling with her mother. Although I’ve always had a dear connection with my Mom, we’re not personally close, as my strict, tight-lipped Catholic upbringing allowed us to share practical information, food and love, but not ideas or god-forbid personal longings or desires. However I did see another side to her in traveling, as you do. A wilful, independent side of her personality, haggling for rugs and marble and jewels in each respective city. Incidental, random stories emerged too, for example she shared this gem over dinner. At home, as she was leaving a local restaurant, she passed by a table and noticed they ordered the fish. Mom: I said to the man, I was going to get that fish but didn’t know if I’d like it. Here, try mine, he replied. Mom: Only a little bite. Me: What? You ate off a stranger’s plate? Did he seem shocked when you said yes? Mom: I don’t know. Glad I didn’t order the fish though, I didn’t like it. Another day, we were driving between cities and she said “when I leave this place…” her voice trailed off and she paused before snapping “pay attention!” Ok I replied and she repeated, “when I leave this place, can I take the flowers” (she meant the beautiful fresh-cut frangipani and temple tree flowers from the hotel room). Gees, I replied I thought you meant leave, as in leave this place and were giving me instructions on arrangements. To which she replied, oh who cares about that! We both laughed. Quite possibly people don’t see many mother-daughter travel partners, as everyone we met went out of their way to be kind to us. We were respectfully welcomed and well-wished in each locale. I did have to contend with “being the guy” for the trip sorting all the itineraries, tours, logistics, payments and tips. Hard work being the responsible one in charge. Not sure my Mom will ever fully understand me; she loves me though and I will cherish the memory of our Indian adventure. This entry was posted in India and tagged Delhi, Golden Triangle, Jaipur, Photography, Taj Mahal, Travel. Great blog Marianne! I completely understand your relationship with your Mom as I too was raised the the “tight lipped” Catholic upbringing! Glad you both had fun!